Koovagam Festival is dedicated to the worship of Aravan at the famous Koothandavar Temple near Villupuram in Tamil Nadu. Koovagam Festival 2019 date is from April 15 to April 17. The marriage takes place April 16. Next day the thali is removed, mourning the death of Aravaan (Koothandavar). It is said that Sri Krishna took the form of Mohini – a female form to marry Aravan who was to be sacrificed before the Mahabharata war. The festivities begins a fortnight before the two important days mentioned above. Some rituals are held during these days too. The two-week long festival begins on April 3, 2019, and ends on April 17, 2019. Miss Koovagam competition will be held on April 15. 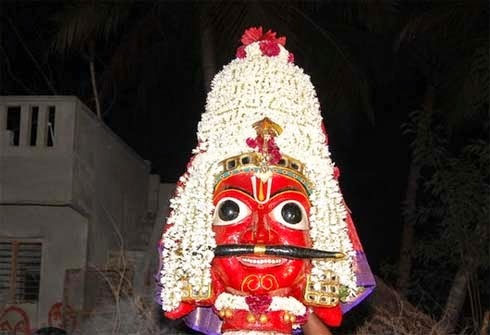 Note on 2019 Koovagam - the festival is regularly observed on Tuesday before Chithirai Pournami (April 19, 2019). But the temple sometimes can conduct the ritual on another date. There is no consistency. So it is better to wait for the official temple dates to arrive before booking flight, train and hotels. Confirmed date of the main festival is April 15 to April 17, 2019. The festival observed on the Tuesday before Chithirai Pournami or the full moon day in Chaitra month. Thousands of transgender, homosexuals, and eunuchs participate in the festival. The festival includes the marriage of Iravan and his sacrifice. On the final day, an effigy of Koothandavar (Iravan) is burned – symbolically his sacrifice. Koovagam Village is located around 30 KM from Villupuram in Tamil Nadu.